It was left until 7 days before the start of the World Cup but the official World Cup fantasy football game is available now! It shares similarities with the traditional Fantasy Premier League game but does have some rather noteworthy differences also. 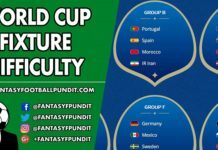 We discuss the rules of the official World Cup fantasy football game and the consequential strategies below. 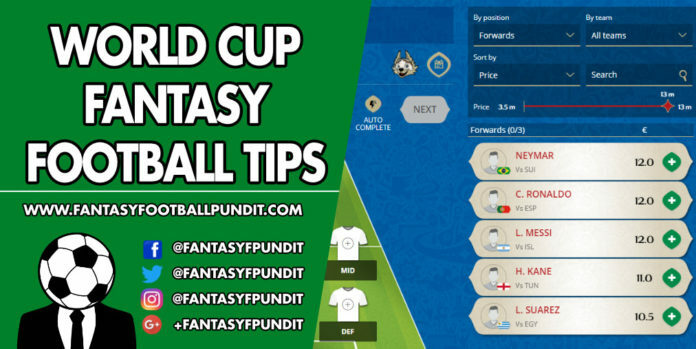 All the World Cup fantasy football tips you need are shared here. To create a team use this link: https://fantasy.fifa.com/en/home To join the Fantasy Football Pundit league, use this code: 8KERMH4J (all capitals). No bonus points is the biggest change as this means World Cup fantasy managers need not worry elements such as possession, interceptions and shots off target. This is the biggest and most notable difference between the World Cup fantasy game and Fantasy Premier League. This is an important difference and will likely be the difference between a successful or unsuccessful World Cup. Automatic substitutions will still apply when a player in your starting 11 doesn’t play. In traditional FPL substitutions are automatic when a player from your starting 11 doesn’t play. In the official World Cup fantasy football game this is not the case. At the end of a single day’s play you are allowed to make unlimited substitutions. This allows you to switch any player (unless they have been sent off) with a player from your bench who hasn’t yet played. Naturally players who are substituted out will score 0 points and they will be unable to be put back in your team for that round. This is quite the change and managers who play it correctly will reap the benefits. Essentially this means you get four free attempts with players. For example if you pick someone risky such as France’s Ousmane Dembele and he doesn’t perform/start then you can freely transfer him out. The only thing you will lose is the opportunity cost of the €8.0m he cost. It’s important to note that you need someone who is playing after the player you transfer out. This strategy allows you to take greater risks with players in the early groups. There is a balance to this however, where you need to make sure you don’t get greedy and transfer out a player who did get points on the board. All of this also applies to captains! If you select a captain from Uruguay (who play on the second day) and he doesn’t perform as you’d hoped then you can change switch the captaincy from him to someone playing after. Theoretically this gives you 6 difference chances at a captain in round 1 and 2, and 4 different captain chances in round 3! The rules don’t explicitly state you can change your captain as many times as available but they certainly infer that. This article will be updated when there is total clarity on this.